A device that allows people wearing noise-cancellation headphones and headsets to hear acoustic warning signals (e.g. police and ambulance sirens, car and truck’s honks, loud noises, designated words, honking, announcement, announcement tone, or any other loud sounds or predefined pattern of sound), especially runners, cyclists, construction workers, factory workers, and airport/airplane workers and passengers. Abstract: The present invention provides for a portable apparatus and method for detection of environmental warning signals. 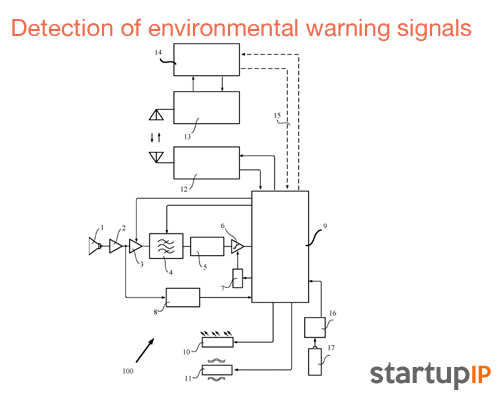 The apparatus having an acoustic input device configured to produce an electrical representation of detected environmental warning signals, an electronic pre-processing unit configured to determine if the electrical representation satisfies a primary set of criteria, an electronic post-processing unit configured to verify if the electrical representation satisfies a secondary set of criteria and a warning indicator configured to transmit an alarm notification. The method having the steps of detecting an environmental warning signals, producing an electrical representation of the detected environmental warning signals, pre-processing the electrical representation to determine if a primary set of criteria has been met, if the set of criteria has been met, post processing the detected electrical signal to determine if a secondary set of criteria has been met and producing an alert message through at least one of an audible indicator, vibration indicator, visual indicator or wireless signal transmitter. Print your circuit boards, dispense solder paste, and reflow! The Voltera V-One lets you go from concept to creation in minutes. Building circuit boards is fun but difficult. While you could do it at home with a some etchant and some clear plastic, Voltera hopes to make the entire process much easier with their V-One circuit printer.